Ultra-Low Power Consumption Power Relays from American Zettler in Building Emergency Lighting Applications | American Zettler, Inc.
With even more stringent energy savings standards in building and lighting controls, reduction of power consumption continues to be a major industry trend. The design of an industry-leading manufacturer of emergency lighting solutions for commercial buildings required seamless switching between line and battery back-up power at times of power loss, while also demanding very ambitious low-power consumption. 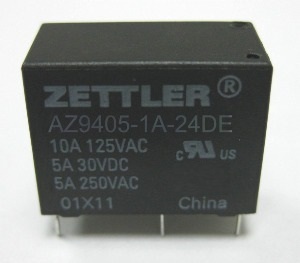 American Zettler met this challenge by developing a super-sensitive coil version of its AZ9405 relay. The relay, originally developed as a general purpose and appliance relay, features a special coil that consumes only 150mW of coil power, less than 40% the typical 400mW used in relays of the same form factor. Given that relays can be one of the highest power-usage components in a system, the AZ9405 is an excellent choice for low to medium power control boards with multiple relays. UL recognized switch ratings are 5A@277VAC / 30VDC for the NO contact and 3A@277VAC / 30VDC for the NC contact. These ratings were also tested at elevated temperatures and cycles: 85 C for 100K cycles. This is the second relay from American Zettler specifically developed to target power savings as a major design goal, as the company focuses on providing intelligent component solutions that help drive energy efficiencies in lighting, energy controls and similar building automation applications.